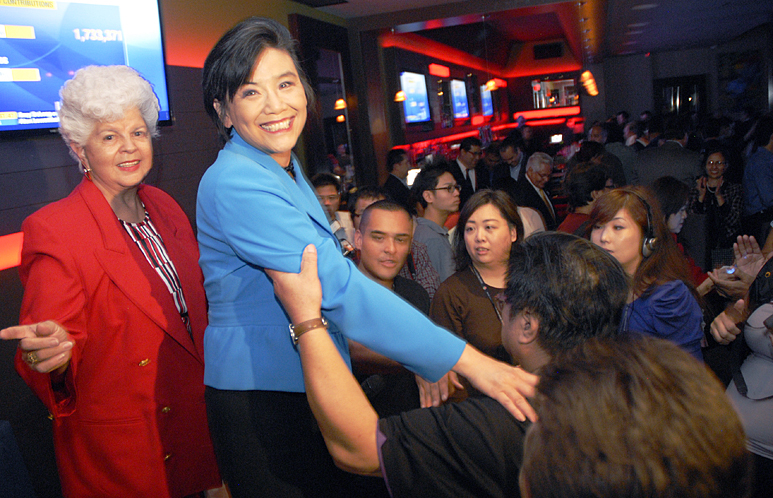 ALHAMBRA — Judy Chu could hardly keep the beaming smile off her face Tuesday night. As the results of the national and local elections began to roll in, it became clear that a good night was taking shape for the Democratic representative from California’s 27th district, and others from Southern California races. When the networks began announcing that President Barack Obama had been re-elected, the capacity crowd at the Boteco Restaurant in Alhambra became ecstatic. Jason Pu, who will seek a City Council seat in San Gabriel’s next municipal elections, said the win for Obama over former Massachusetts Gov. Mitt Romney is an affirmation of the president’s vision and plans for the nation. 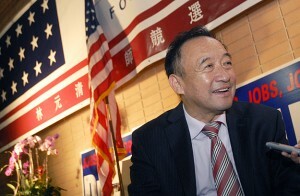 GOP Assembly candidate Matthew Lin chats at his election night gathering in San Gabriel. Chu (D-El Monte) was leading comfortably over Republican challenger Jack Orswell, 57.3 percent to 42.7 percent, with nearly 58 percent of the returns calculated early Wednesday morning. With 57.8 percent of precincts reporting in the 41st District, the California Secretary of State’s Office had Democrat Mark Takano of Riverside ahead of John Tavaglione, 54.8 to 45.2 percent. By early Wednesday, two closely-watched Assembly races were still undecided. With 65.5 percent of precincts reporting, Al Muratsuchi (D-Torrance) was out in front of Republican Craig Huey, 52.8 to 47.2 percent. The race for the District 49 seat between Democrat Edwin Chau and GOP candidate Matthew Lin was also too close to call, with Chau leading by slightly over five percentage points with 65.5 percent of the votes counted. At a rally in San Gabriel, Lin remained upbeat late Tuesday and expressed gratitude to his supporters and volunteers for their efforts.